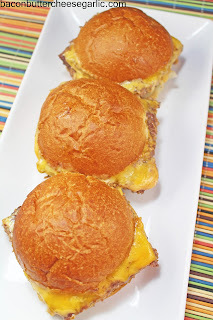 I've never personally had White Castle Sliders, but my husband has and he says these taste just like them! Sure, I know they're usually on square buns. But he did the grocery shopping this week and this is what he brought me. Still darn tasty, no matter what the bun shape. Enjoy! Mix the ground beef, the 1/2 C stock and salt and pepper together by hand. Place a piece of wax paper on a sheet pan. Spread the beef out into a 1/8 inch thick rectangle on the wax paper. It will be roughly about 14" by 11". Lightly score the beef into about twelve 2 1/2 inch squares. Using a straw or your finger, poke five holes into each patty, kind of like the 5 on dice. Freeze the beef for 1 hour. Preheat the oven to 450 degrees. Mix the 1 C beef stock and the minced onions together. Pour the mixture into another large sheet pan. Try to spread the onions out evenly. Place the beef on top of the stock mixture. Steam bake the beef for 10-15 minutes or until it's done. While the beef is cooking, separate your bun tops and bottoms. When the beef is done cooking, take the pan out of the oven and lay the cheese slices over the squares, overlapping the cheese if necessary. Top with pickle slices and the bun tops, putting the tops right up next to each other. Return the pan to the oven and cook for a few minutes to melt the cheese and heat up the top bun. To serve, cut the burgers between each top bun. Use a spatula to pick up each burger and place it onto the bottom bun. Okay. So when I came across this recipe, I really had my doubts. It was everywhere on Pinterest, but I thought it couldn't be good and it needed more stuff in it. But I was so wrong. 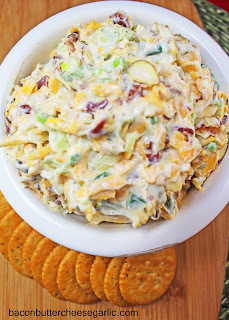 This Neiman Marcus Dip is fantastic! I couldn't stop eating it. I'm not sure why it's named after the department store, but it's not on their restaurant menu. It doesn't matter to me what it's called. It's good. NOTES: Some recipes I saw called for 1 1/2 C mayo. I started with that and thought it was too dry, so I added another half cup. Also, some recipes call for prepackaged bacon bits, but I wanted the real thing. But feel free to substitute it for ease. The garlic powder and pepper are all my idea, so you can use it or leave it out. If the almonds aren't already toasted, put them on a sheet pan in a single layer and into a 350 degree oven for 5-7 minutes to slightly brown them. Watch them carefully so they don't burn. Let them cool. Let the bacon cool too. Mix all of the ingredients together and chill for at least 1 hour. Serve the dip with crackers or chips. So my wonderful husband got me a puppy for Christmas! I love puppies, especially Boxers. Our newest Boxer is Roscoe. He's still small, but he has really big feet and big floppy ears. Our other Boxer, Cooper, is a little jealous and is acting out a bit. Our third dog and oldest, Bentley, doesn't seem to care one way or the other about the new puppy. But...three dogs is a lot. You can't walk anywhere in the house because they are always in front of you. Roscoe wants to jump on you all the way to the back door and doesn't seem to understand the word "no" when he's jumping on you. There is a little competition over the puppy food and over the toys. I guess I don't have it as bad as some. My boss actually has five dogs and for a while he had seven dogs. I can't even imagine! But we love them and they are a part of the family. My husband even shares a tiny bit of our Sunday breakfasts with them. Anywho, I made these Beef Tips in Mushroom Gravy yesterday in the crockpot. It literally took me five minutes to throw it together. It turned out fantastic! I served mine over mashed potatoes, but I bet egg noodles would be great here too. I took the leftovers to work and it was a big hit. This is a darn tasty meal that will please everyone! Put all of the ingredients into a crockpot. Don't add any liquid. Trust me, you won't need it. Cook it on low for about 8 hours. Serve it over mashed potatoes, egg noodles, or even rice. This is a very indulgent when-you-want-to-splurge recipe. 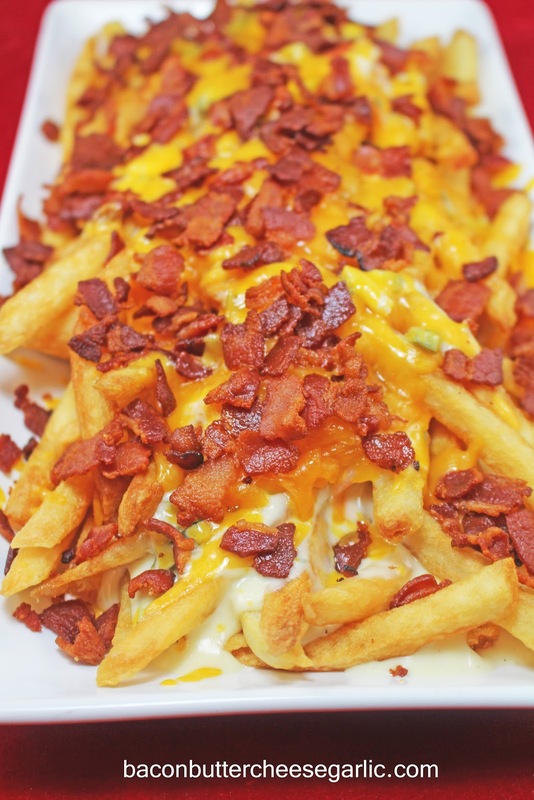 These Bacon Cheese Fries include the recipe for perfect french fries, a creamy queso, and are covered in bacon and Colby Jack cheese. They're fantastic! And, while the fries may take some time, trust me, they are perfect. Put the potatoes in a pot of heavily salted water. The salt draws out the moisture. Plus we found there was no need to salt them after cooking since they were perfectly salted. Turn the pot on high and bring it to a boil. When the first few big bubbles show up in the water, turn them off and drain them. Lay them on a sheet pan lined with paper towels. Put them in the fridge and leave them there until they are cooled. Bring the oil to 385 degrees. Fry the potatoes for a few minutes or until they are golden brown. Remove them from the heat and drain. For the queso, cook the onion and jalapeno in some olive oil until they are tender. Stir in 1 1/2 C heavy cream and the garlic powder and bring it to a boil. Turn the heat down to low and stir in the shredded cheese, adding the additional 1/2 C cream if it's too thick. Whisk the queso until it is smooth. Remove it from the heat and stir in the tomatoes and cilantro. Put the fries on an ovenproof plate or tray. Pour the queso over the fries and top with the Colby Jack cheese. Put the plate under the broiler for a couple of minutes to melt the cheese. Sprinkle the bacon over the top and serve. A lot of times I go to great lengths to make dinner, especially on Sundays when I have all day to do it. But sometimes I just want something quick and simple for dinner. Something that I can throw together simply and without any stress involved. This Pasta Arribbiata is just such a dish. Arribbiata means angry in Italian. I promise you, I wasn't angry when I made this. But the angry refers to the incorporation of red chili flakes, making it spicy. It's usually served with penne pasta, but I didn't have any so I went with plain old spaghetti. 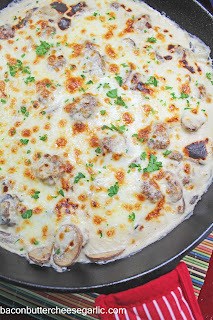 It's truly a simple dish with very few ingredients, but it's so good! And surprisingly there's no meat in it, something I very rarely do. And, while I used a really good quality carton of strained tomatoes, it tastes fresh, probably a lot closer to authentic Italian dishes. If you're in a bind and want to get dinner on the table fast, this dish is for you. Enjoy! Cook the pasta according to the package directions and drain it. Meanwhile, drizzle a generous amount of olive oil into a skillet. Cook the garlic and chili flakes over medium heat for about 1-2 minutes, stirring constantly to avoid burning the garlic. Add in the tomatoes and salt and pepper, to taste. Bring it to a boil and then reduce the heat and let it simmer, covered, while the pasta cooks. 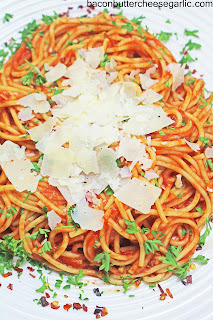 Serve the pasta with the sauce and garnish with the basil and Parmesan cheese, if desired. 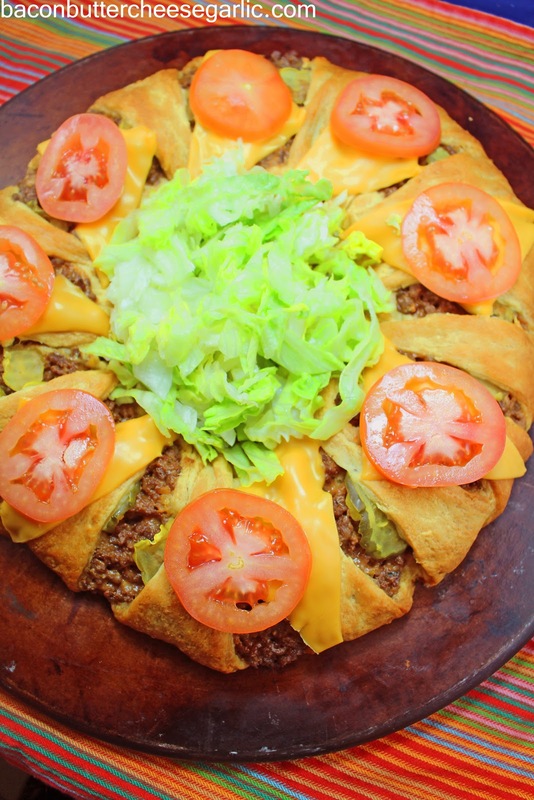 This tasty Cheeseburger Ring is great for parties, football games, and is really kid friendly! It's easy to put together and reheats well. Enjoy! Preheat the oven to 375 degrees. Brown the ground beef with the minced onion and salt and pepper, to taste. Stir in the mustard and ketchup. Stir in 5 of the cheese slices until combined and smooth. Remove the meat from the heat. Lay out the crescent roll triangles on a large sheet pan to look like the picture below. Spread the meat mixture along the overlapped portion of the crescents, toward the center. Lay some pickle slices along the meat. Fold the points of the crescents into the center of the circle, pressing under to close. Bake the ring for 20-25 minutes or until the top is well browned and done through. 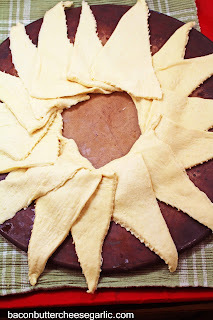 Cut the remaining cheese slices in half diagonally and lay them over the top of the crescents. Return it to the oven for a couple of minutes to melt the cheese. Garnish with the tomato slices and put the chopped iceberg in the center, if desired. Okay. So the last 30 days have been way too eventful for me. Seriously, more crazy stuff has happened lately in my household than in the last year. I had emergency abdominal surgery and stayed in the hospital 8 days, being released on Christmas Eve. (Yes, I was really just trying to get out of work for the busiest time of the year.) I came home with 15 staples in my stomach and had a house full of people. We had the third largest snowstorm in our town in history. My husband came home with a new truck. My daughter totaled her car. I got a new puppy for Christmas. (Now we have three dogs.) It's been hectic, to say the least. I'd like at least the next 30 days to be peaceful. I can't ask for quiet since we have a new puppy who is very vocal. So I have been craving tacos for awhile now, and I finally got my chance to have one. I made these Meximelts last night, and they were great! Finally, tacos. 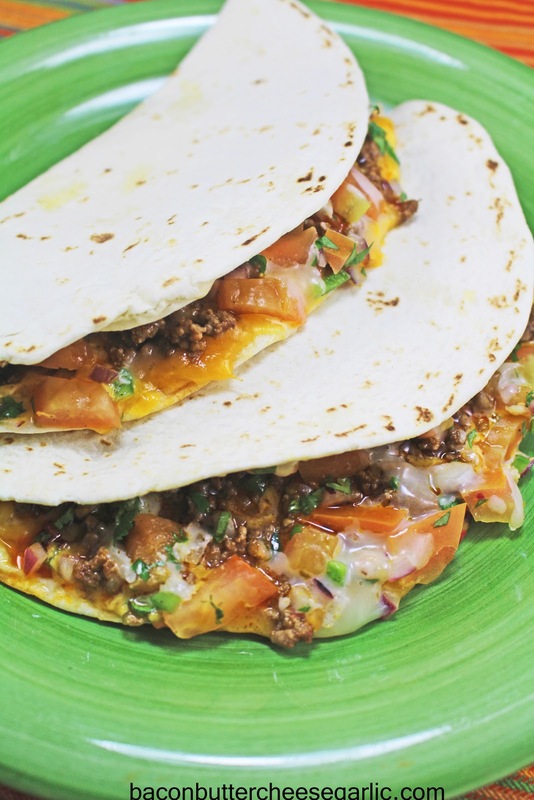 Now, these tacos can have pretty much whatever filling you like in them. I just went simple with taco meat, cheese, and pico de gallo. The real stars here are the way I cooked the tacos so that the tortillas stayed soft and the addition of pico de gallo. It was the perfect combination. Fill yours however you like. Just don't skip the pico de gallo. Enjoy! For the pico de gallo, stir together all of the ingredients and put it in the fridge until you're ready to use it. Cook the ground beef and add in the taco seasoning according to package directions. Preheat the oven to 350 degrees. Spread the cheddar cheese over half of each tortilla. Top the cheddar cheese with taco meat. Spread the Pepper Jack cheese over the taco meat. Top each tortilla half with pico de gallo (you will have some left over. It's great with chips). Fold the other half of the tortilla over the filling so that you have 4 half moons. Wrap them up in foil. Put them in the oven and cook for about 10-12 minutes or until the cheese is well melted. Serve with sour cream, if desired. I love sandwiches. I always have. I remember, even as a kid, going into the kitchen and trying out new and different combinations between bread. I still do that. I could probably eat a different sandwich every day of the week if I had enough interesting ingredients to use. I also really REALLY love a restaurant called Texas de Brazil. I so wish they were paying me to say that, or at least give me a free run at their salad bar. Anywho, their concept is that they give you a card with a "yes" side and a "no" side. Men called gauchos come up to your table with beautiful skewers of different kinds of grilled meats. If your card is on "yes," they will carve off a piece of whatever grilled delight they have right onto your plate. The food is all Brazilian inspired. And, like I said, their salad bar is fantastic! I could make myself sick eating at just the salad bar alone. So what does that all have to do with sandwiches? 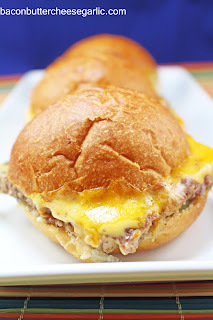 Well, these Gaucho Cheesesteaks are kind of inspired by the Brazilian steakhouse idea. 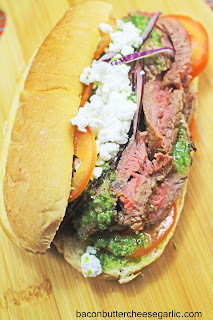 Thinly sliced seared steaks get topped with a chimichurri sauce of sorts, sliced tomatoes, red onions and goat cheese. I just adore these sandwiches. They are easy to make and darn tasty! If you're a fan of tangy chimichurri sauce and goat cheese, this sandwich is for you. Put all of the chimichurri sauce ingredients into a blender and blend until smooth. Put the sauce into the refrigerator until you're ready to use it. Preheat the oven to 200 degrees. Wrap the hoagie rolls in foil and warm them in the oven while preparing the steaks. For the steaks, melt the butter in a large skillet and drizzle in some olive oil. Get the pan screaming hot, almost to high heat. Season the steaks with salt and pepper. Sear the steaks quickly on both sides, being sure to brown it well before flipping it over. Depending on the thickness of your steaks, it could take 4-6 minutes per side for medium rare, longer for medium well, etc. Remove the steaks to a plate and cover them with foil. Let them rest for 10 minutes. Once the steaks have rested, slice them very thinly against the grain. Serve the steaks on the split hoagies with the chimichurri sauce, goat cheese, red onion, and tomato slices. I have a thing for mushrooms. Seriously, I could put them in anything. I remember when my husband and I were dating. He wouldn't eat spinach, mushrooms, or salad. I remember the first time we did steak date night at home. I made sauteed mushrooms and creamed spinach to go with his steaks. He was skeptical, but he didn't want to hurt my feelings so he tried it. And...he loved it! Both the spinach and the mushrooms! Now we don't have steak night without either one. 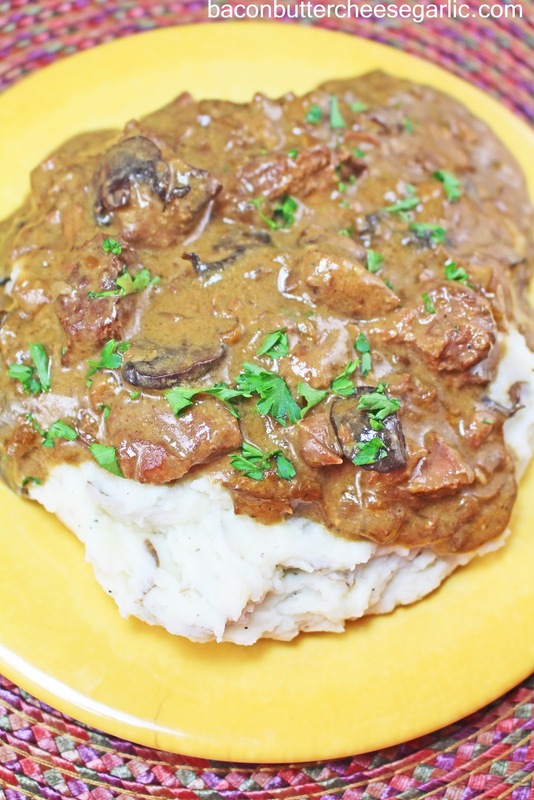 So I was craving mushrooms the other night, so I came up with this Meatballs in Mushroom Sauce. 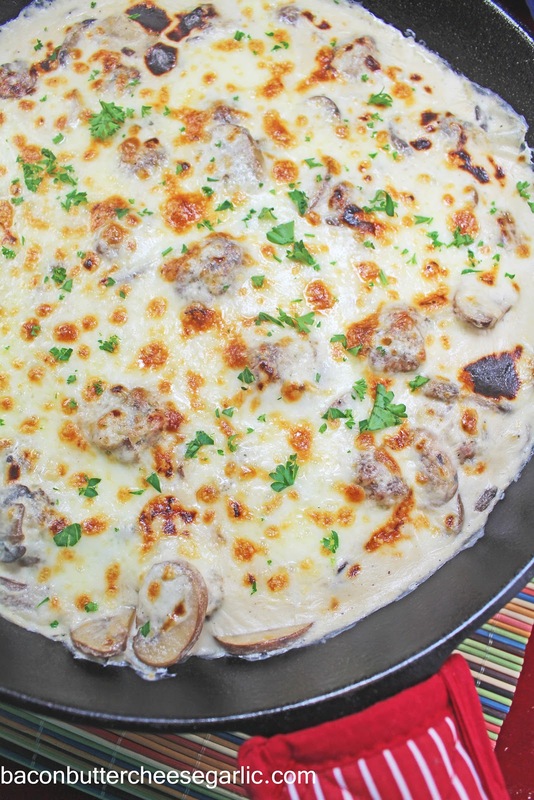 It's creamy, cheesy, and hearty. And it's really not that hard to put together. It's great for a cold night and hungry people. And it's darn tasty! Preheat the oven to 350 degrees. Mix all of the meatball ingredients together except the olive oil. Shape them into half-inch meatballs. I got about 24 meatballs. Put them on a sheet pan and drizzle them with olive oil. Bake the meatballs for about 20-25 minutes or until they are done and browned. Meanwhile, melt the butter in a large ovenproof skillet and drizzle in a little olive oil. Cook the mushrooms and shallot over medium high heat until the mushrooms are tender. Sprinkle the flour over the mushrooms and stir. Pour in the half and half and stir until smooth. Bring the sauce to a boil. Add in the Worcestershire sauce, Parmesan cheese, and salt and pepper to taste. Cook and stir until thickened, about 1-2 minutes. Remove from the heat. Turn the broiler on. Stir the meatballs into the sauce. Sprinkle the shredded cheese over the top. Put the skillet under the broiler and broil for a couple of minutes to melt and brown the cheese. Serve with pasta, rice, or mashed potatoes.